We’ve extended the search all the way up to 20. Someone has stolen my numbers and I need them back! The class really enjoy it when I pretend like that. They’re only in P1 and they really respond to a bit of humour and imagination. The missing number to 10 game was a great hit and seems more durable and child-proof than I had imagined (the same cannot be said of the pipe cleaners unfortunately). It did take a ridiculous amount of time to attach the sticky back velcro, but I think it was worth it. I put the 11 – 20 section under the original 1 – 10 as if we’re building a hundred square. It will help them see the similarities between the 2 different decades and also I think a long line to 20 would be tricky to make, use and store! I’ve planned this activity as independent extension for those who are ready to explore past 10. The children who have tried it are managing really well. The only misconceptions I’ve had to challenge is having 12 in the 20 position. I’ll keep this in mind for when I formally introduce children to numbers 11 – 20. I will need to make sure the children understand what the 1 in the teen numbers actually means. 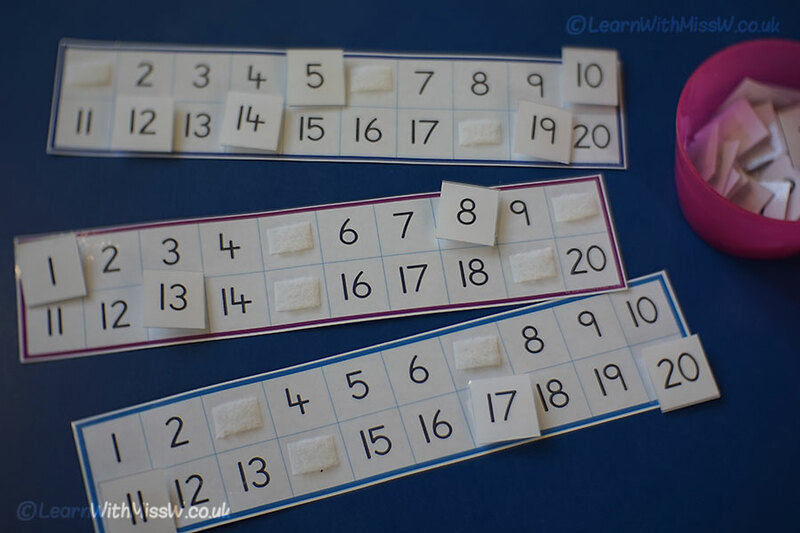 Follow these links to download the missing numbers to 10 and missing numbers to 20 activities. Probably don’t bother with the pipecleaners!